Machine Scrubbing – We use a low speed 175 rpm floor machine and a Scrub-Grit brush to get into all the nooks and crevices. Machine scrubbing is preceded by the proper application of cleaning chemicals to emulsify the soils present in the cleaning area. This method is always followed by extraction of the soiled solution or by using the Turbo Hybrid. Turbo Hybrid – This is a unique machine that High Pressure Washes the tile inside of a Vacuum. Sealing – We use many types of sealers depending on the needs of our client, the type of the tile, and the end results desired. Wherever possible, we prefer to use a penetrating sealer that actually fills the pores of the tile to inhibit staining and make cleaning easier. We carefully select only the best tools, equipment and chemicals on the market to clean your tiled floors. We give you the best value! Our pricing is based on the size of the area being cleaned and the amount of prep work needed to safely accomplish the task. Our technicians will be happy to inspect, measure and give you a Guaranteed Price Quote at your convenience. If you prefer a phone quote, just give us a call and we will talk you through it and give you ballpark estimate for your tiled area. When cleaning tile & grout, we always start by preparing the work area by protecting the walls, baseboards, carpet, or other surfaces to make sure we can safely clean the area without damaging the other surfaces. We will carefully inspect your grout as it is the “weak link” in tile and grout cleaning. The biggest problems are usually with the grout. So many variables are at play that it is hard sometimes to pinpoint the cause of cracking grout, however, it is often a combination of poor installation, poor materials or poor mixing of materials. It is not uncommon for damaged grout to break loose during cleaning. If you have damaged or cracked areas, be sure to ask your technician what solutions they would recommend for your particular site. 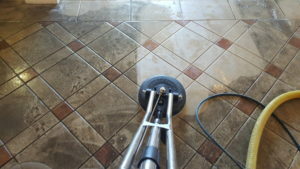 Looking for quality grout cleaning and tile sealing in Omaha? Contact us today to schedule a free estimate.